After reviewing others’ definitions, Israel writes, “Enlightenment is, hence, based characterized as the quest for human amelioration occurring between 1680 and 1800, driven principally by ‘philosophy’….leading to revolutions in ideas and attitudes first, and actual practical revolutions second, or else the other way around, both sets of revolutions seeking universal recipes for mankind, and, ultimately, in its radical manifestation, laying the foundations for modern basic human rights and freedoms and representative democracy.” (p.7). While the treatise covers all strands of enlightenment thinkers throughout the Western world, Israel distinguishes them as either moderate or revolutionary enlightenment thinkers. The moderate Enlightenment thinkers considered the philosophical and scientific assumptions of the past to be broadly wrong, and thus in renewing science, philosophy, and culture, they introduced religious toleration and legal, educational, and social reforms. Israel writes that “many felt that reason is not and should not be the only guide and that a balanced compromise between reason and tradition, or reason and religious authority is necessary. Some leading proponents of moderate enlightenment such as Voltaire and Hume accorded little or no validity to religious authority, but nevertheless remained anxious to restrict the scope of reason and retain traditional and ecclesiastical authority, duly clipped, as the primary guides for most people.” (p.11) There was a marked tendency for moderate Enlightenment thinkers to not want to disseminate philosophy to the common man. In contrast, the radical enlightenment thinkers claimed that the former were on a slippery slope and were compromising with the existing order and disavowing reason’s applicability in some areas. The radical enlightenment thinkers were insistent that first principles be thought through, their applications debated, and that a new intellectual and social order must arise from that dialogue. If habit and tradition could not stand the test of an impartial logic, whether in custom, monarchy, or ecclesiastical explanation, it was to be brushed aside for it weighed down new thinking. The radicals sought fresh, universal principles, based on reason, to be applicable to the progress of mankind. Israel elucidates the insights of many radical enlightenment thinkers, including those Thomas Paine credits in the development of his ideas in his chapter on “The American Revolution”. However, Paine himself said that he was only “a gardener of ideas” and in retrospect did not fit into either the Lockean tradition or early republican tradition in spite of using the revolutionary language of the day. However, Paine’s widely disseminated Common Sense placed him squarely in the radical enlightenment tradition as Israel has defined it, helping to transform “reasonable reformers” into revolutionaries who risked their lives and livelihoods. Paine’s fiery thought and speech encouraged a new age of man: human beings identifying themselves not as subjects but free citizens, while enabling free expression based on debate, reason, and choice through democratic representation, rule of law, and human rights. Israel points to a foundational root of the revolutionary enlightenment thought as Baruch SpInoza’s philosophy whom Paine, later in his life, probably read according to Caroline Roberts “the Lifelong Education of Thomas Paine” (1737-1809), PAPS 127, 1983, 135-42. A sub theme for Israel is that Spinoza was used as a foil for anti-enlightenment thinkers as well as moderates. Israel suggests that Spinoza’s more coherent philosophy stood the test of time, was periodically obscured or intentionally inverted, yet continues to emerge and reemerge (as Paine thinking has). 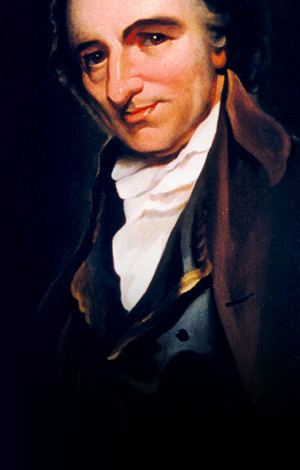 Israel defines philosophy at the time of Enlightenment as Adam Smith did: “the science of the connecting principles of nature”. Spinoza’s thinking had a similarity to Paine’s though the latter was not a philosopher per se. Spinoza, for example, posited a one substance principle—that nature, including human nature, is a manifold expression of God. Man can express their love of God through reason; thus connecting to his deeper, truer nature while simultaneously understanding the nature of others. Moral reasoning, Spinoza wrote, connects man to nature, providing an ability to see things more clearly and to self-correct, providing the basis of true freedom and realization of human potential on the basis of natural law. For Spinoza, freedom is the recognition of necessity. Therefore, philosophy was (and some say is) the royal road to perfectibility of human nature transcending modern psychology. The ability to reason and give reasons, within the spirit of nature and natural law, to make logical connections, and apply them to everyday life is the human potential Paine argued can be realized and perfected within every person to varying degrees in daily life and politics. A radical democratization of the potential of reason, stemming from first principles and natural law, intrinsic in every human being, became a basis for Paine’s reasoning on behalf of the dignity of man and universal human rights. Spinoza argued, before Paine and others, that we must strip every church and priest of political authority in order to allow free expression through moral reasoning. Paraphrasing Israel “For any residual power of church and politics not only detracts from the absolute power of a democratic republic but is inherently divisive, mobilizing some in society against others, classifying men by beliefs, and breaking up the true collectivity of a democratic republic by creating ranks.” Thus morality should be detached from theology, organized religion separated from state, for morality has no other basis than the universal well-being for each and all in society. Jonathan Israel’s scholarly and courageous work helps situate Paine’s vision of a universal society in Enlightenment thought by untangling and restoring the historical significance of obscured Radical philosophy as critical to understanding the advance of human freedom and democracy. While not everyone may resonate to scholastic philosophy, the need to appeal to and to apply abstract principles such as liberty, justice, and democracy thoughtfully and fearlessly has implications for today’s democratic revolutions across the globe as moderate and radical “enlightened” reformers vie for power. Israel’s volume reminds us of the power of disciplined reflection and public articulation of higher, more unifying principles as Martin Luther King and others have instantiated and inspired others to take up through example. The implications of Enlightenment ideals and Thomas Paine’s vision of freedom and justice still speak to those who love humanity.